The Professional Regulation Commission (PRC) and the Board of Mechanical Engineering released results of March 2014 Mechanical Engineer (ME) board exam in 2 working days after the last day of exam. The complete list of passers, top 10 (topnotchers), top performing school and performance of schools are available here as officially published online today, March 25, 2014. PRC named 793 out of 1,310 who passed the Mechanical Engineer Licensure Examination and 22 out of 42 new Certified Plant Mechanics (CPM). Mechanical Engineer board exam covers the following subjects: Power and Industrial Plant Engineering, Mathematics, Engineering Economics and Basic Engineering Sciences. Meanwhile, board exam for Certified Plant Mechanics (CPM) covers the following major subjects: Elements of Power Plant Machinery, Shop Machinery Practice and Elements of Industrial Plant Machinery. In March 2013 exam, results were released in two (2) working days after the last day of exam. 717 out of 1,309 passed the Mechanical Engineer board exam and 24 out of 45 passed the CPM. 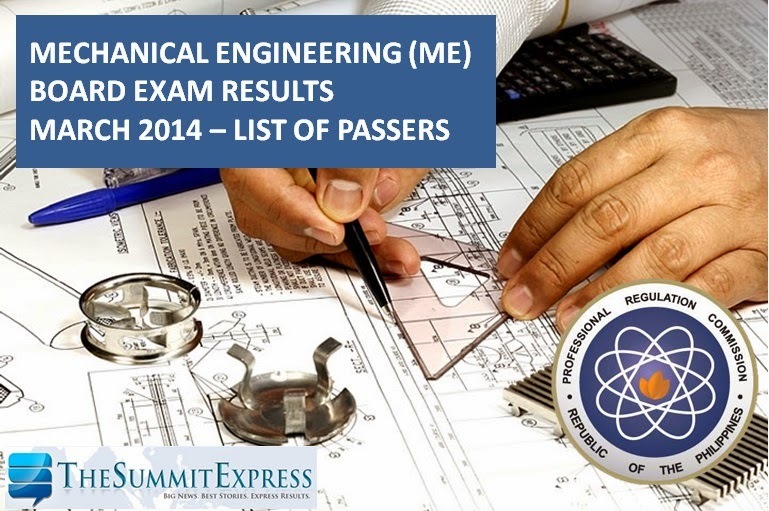 September 2013 Mechanical Engineering board exam results were also released in two (2) working days. 2,201 out of 3,196 passed the ME and 30 out of 62 passed the CPM.